On Nov. 10, 2013, Betty Jean Butts, beloved wife and mother, surrounded by her loving family, passed on from natural causes to the arms of our heavenly father. Betty was born in Kalispell on Dec. 6, 1932, to Edward and Pearl Clarke, followed soon after by her three brothers: Richard Clarke of Oregon; and Ted Clarke and David Clarke, both of Eureka. 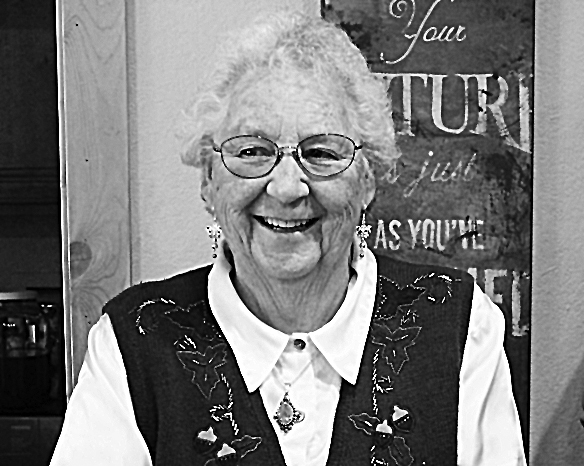 Growing up on a ranch on the West Kootenai, Betty knew how to work hard and enjoy everything that life brought to them. On Feb. 6, 1953, while working in Roseburg, Ore., Betty married Roy Butts, her high school sweetheart and the love of her life. They enjoyed over 60 short years of love, life and laughter together. Betty loved to travel and she loved her handiwork — knitting, needlepoint, sewing, quilting and so many other talents. Her family was always the most important focal point of her life. Betty nurtured and instilled love and togetherness in all of the lives she touched. Betty’s smile and her love of life will be terribly and sorely missed by all who knew her. Betty is survived by her three younger brothers: Richard, Ted and David; husband Roy; children Jan and husband Jim Dry; Ken and fiancé Sue Thompson and daughter Sarah Thompson; Jean and husband Ron Glasgow; grandchildren Jacie Sievers, Brian Glasgow, Tyra Glasgow, Randy Glasgow, Beth Glasgow, Tracey Glasgow, Ronnie Glasgow and great-grandchildren Kaiden and Liliauna Glasgow. A celebration of life for Betty will be held at 2 p.m. on Sunday, Nov. 17, at her brother Ted’s residence at 341 Rivers Edge Drive, Eureka. Gifts or donations are asked to be given in Betty’s name to the Heart Association.